Hubby gave me exactly 1.5 days to make this card for a colleague’s retirement! Fabulous right? Yeesh… At least I was happy with how it turned out! 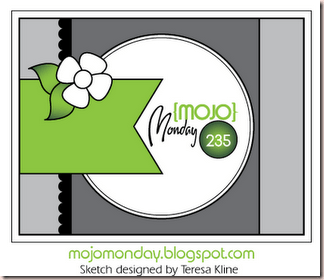 I used the Mojo Monday sketch from this week. Click on the sketch below to link to their blog. I haven’t managed to play a contest week for a while so I am excited! Especially since I won the CPS 158 last week! AND I was one of the Terrific Top Three Winners at the Shabby Tea Room 107! Wahoo! I wasn’t thrilled with my Copic colouring on this one, I think it lacks a bit of depth but it’s ok. I was making it between 1 and 3am so I might have spent more time on it normally. I just noticed that I should have made the sand closest to the water darker to make it look wet and the sand under the chair should have been darker too. Ooops! I used a Spica pen to make the waves and sand look a bit glittery. Here’s a close up of the fish netting and shells I used to embellish it. I got the real fish net in Ocean City (the family version of Atlantic City) and I much prefer it to net ribbon or cheesecloth. See the bird at the top of the oval panel… well, I have to admit, mistakes are the mother of embellishment. I was using a very new Copic marker, Y26 I think, and I noticed it was getting very juicy. Normally I might have clued in to what was about to happen but this was about 1:30 am so nope. You guess it, my marker blobbed all over my work. And did I blot it immediately? No (honestly…)! I just waited for it to dry! It was so saturated that I couldn’t get it all out with the colourless blender. So it became embellished! note to all of you who have Copics. When you get new ones, take off both caps to allow the pressures inside to equalize. That’s what makes is blob, usually anyways. Rarely it can blob because it is overfilled but that doesn’t happen often straight from the factory. 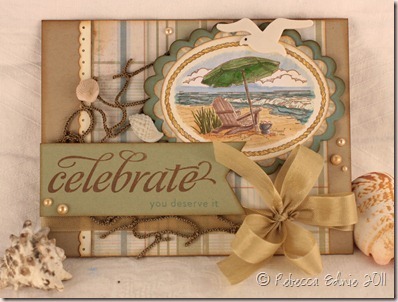 I love beach cards and this one is one of my favorites! Love how you “fixed” the boo-boo. You'd never know. 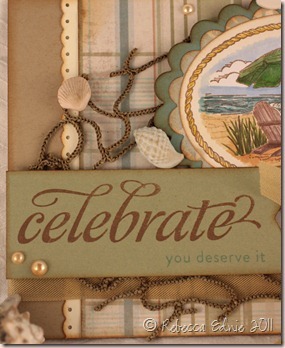 But it's good to hear these things cause it makes the average cardmaker feel better.